Whenever we wake up, we find ourselves in The Room. Always the same room, always the same day, always us, the ones who animate our characters in this sleep of mundane existence. It is not a bad room, but we're sure it's not the only room. When Shugchang wakes up alone, perhaps he wakes up somewhere else. I don't know. I've never been with him when he woke up alone. By the winter of 1993-94, it seemed that we had investigated every possibility of escape from The Room. Somewhere, we were sure, there was a door, and something was on the other side of it, something delightful, magical and unimaginably transformative. Week after week we had probed and tested, looking for that one weak spot in the wallpaper, that one place where we could plunge through -- perhaps never to return; but even return would, we were sure, be to a forever altered reality. The prospect of eternity in that one chamber seemed too mundane to be acceptable. We were tired of ourselves and all of our creations, weary of the effort needed to be an ego, yet somehow finding ourselves unable to shake its trappings. Even with all his brilliance and insight, Shugchang could not zap us loose. But our faith persisted. There had to be a way. 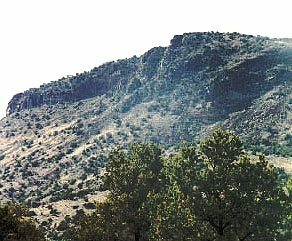 Shugchang looked to tradition for aid in this purification, noted that the Navajo had enshrined four mountains -- standing in the four cardinal directions from their homeland -- as particularly sacred. Doors, they even called them. They climbed these not for view or sport, but Vision. To tread where they had trod...it seemed worth a try. We would start by visiting Chaco Canyon, Sipapu, the navel, the place of emergence. The ancient home of the Anasazi lies right in the heart of Navajo country. Besides, the place is full of kivas. We would follow in the old way. 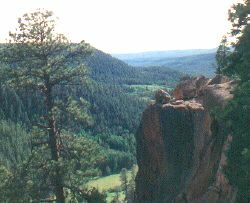 First purify and prepare; an evening at the Jemez hotsprings, then solstice meditation in the ancient gathering place before making an offering to the sun on the peak of Mount Taylor, known to the DINÉ as Tso-odzil, Turquoise Mountain, the Southern Door. Perhaps it would open for us. Shugchang had spotted it while driving by on I-40 a few years previous and was impressed with its mass. He had had a transformative experience climbing a mountain in Guatemala in the seventies, and it had occurred to him when he saw Taylor that all high places are holy, and that this one was more readily accessible than most to a bunch of greenhorn climbers like the Turtle Hillbillies. And so twenty-two of us set out, in a caravan of five vehicles: Shugchang and family; Samten, Getso and family; Rigdzin, Tsering, and their two young children; Tim and Mark, in Tim's sporty little car with a sunroof. He was very proud of that car. Zhibde, Gyatso, and Kunga were not proud of their vehicles and decided to rent a car and travel together. Yiga drove down from Minneapolis in his bread van and met us out west. Almost immediately, there were unforeseen things to be figured out. The rental car crew fell to squabbling with each other over what music to play on the car stereo. Nine Inch Nails or Carlos Nakai? Rigdzin and Tsering fell to squabbling with each other over anything or even nothing (no news there). Getso and Gyatso had upper-class/lower-class squabbles. They also had bad cases of chiggers. Shugchang suggested to Gyatso that they take a shower together and scrub each other down. The implications of that chased Gyatso so far back up her tree that she never even suggested it to her vajra sister. They're still working it out, mostly by avoiding each other, which is not an easy thing to do in a twelve-member sangha. Well, it's easy to do, but it's hard on the Sangha. First, Shugchang suggested that we stop in the heartland to pay our respects to Black Kettle and his little band of Cheyenne who chose the way of peace and good faith over the tomahawk and gun. The sign on the highway misleads the casual traveller as it reads, Battle of Washita. This was a treacherous massacre by any standard and no doubt, they should change the sign. At least thirty Indians were killed in an early morning raid led by the infamous General George Armstrong Custer. Among the casualties were Chief Black Kettle, his wife, and 18 other women and children. There is nothing but rolling prarie out here, a little farmhouse in a grove of trees to the northwest and a vast pasture. We sat in silence near the monument, sort of a large tombstone with the story engraved on it, and looked out over the small grassy hills. We prayed for forgiveness and a better understanding between people as a gentle wind picked up, carrying this prayer to the four directions. Some of the ladies hopped the fence to gather sage and sweetgrass. So having paid homage to the spirit of non-violence demonstrated by the Cheyenne Chief, and immersed ourselves in the hotwaters of the Jemez, our little caravan arrived at Chaco Canyon, the navel of the world, to be reborn at the summer solstice. Driving in, Padma Zhibde and her companions commented to each other on how the desert environment preserved things. Zhibde shared a banana, and tossed the peel out the window. This ancient primate communion was interrupted by flashing blue lights and a park ranger who returned the peel to her for proper disposal. Arriving in time, we thought, for an early evening walk to watch the sunset from South Mesa, we lingered too long and found ourselves shuffling back to the parking lot in darkness, where we discovered that one of the first of us to arrive had, for some reason, headed back to the campground alone in one of our two vehicles, leaving ten people to fit into one car. We solved this by having three people ride on the trunk hood. Again our attention was attracted by flashing blue lights, and a ranger telling us that not only riding like that but hiking after dark were both against regulations. We didn't know it at the time, but while most of us were out violating one set of park regulations, the camp contingent had attracted rangerly attention by playing White Zombie at much too high a volume level for the comfort of the retirees who constituted the bulk of the population in the campground. From a Buddhist standpoint, we and the rangers were doing each other a world of good. Unfortunately they didn't seem to see us that way, which made it difficult for us to appreciate them, too. Just imagine--when the dharma really takes hold in America, even the police officers (especially police officers) will act on the basis of a non-dual view! On one occasion, we started a walk to South Mesa in the early evening. We arrived at the ruins in time to watch the sun set. Thunderheads were gathering on the horizon. I was getting nervous about coming down in the dark. I told Shug Chang I thought we should go, but he declined. My son Dave, started down, and I saw Tenkar on the path too. So I followed her. Later Dave came alongside me and said he was going on to get our car and move it from the lot where we had left it to one closer to where the path meets the road. I said okay. An overpowering sense of an inability to control things was hitting me. I felt alone. I was feeling it wasn't right to let him go. After he was gone, I thought, maybe this is a lesson for him, that he shouldn't walk on his own, as I myself was. Shug Chang and the others caught up and I followed them now. We walked right past the entrance to the first lot, and proceeded on to the second. Like a sheep following the herd, I didn't think for myself. When we got there of course the second car was gone, and Shugchang let us get on the back of his full car to ride to the other lot, but Dave wasn't at the other lot either. So Shug Chang drove us back to camp. This was harrowing. I was on the back with Chodon, and I felt he didn't care at all about us. He was going fast and there was hardly anything to hold on to. I felt several times that I would fall off. Soon the Park Ranger came up behind us, and he was pissed. He had been out looking for us and had run into Dave on the far side of the one way loop that runs through the Canyon and Dave didn't know where we were. Back at the camp, I expressed that it was Dave's fault for going on alone. The next morning Shug Chang told me that I mindlessly followed everyone to the original lot for no reason, because I already knew what Dave had said, and since I was the only one who knew it, why didn't I take responsibility and wait there for him or communicate what had happened? Dave found no one at either lot and went back to camp. 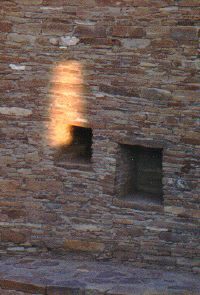 Next morning at dawn, along with Ranger Cornucopia and many other travelers, we gathered at the Great Kiva of Casa Rinconada to watch the rising sun shine through the sacred openings. Sun flashed through for an instant, then disappeared behind clouds. Not an auspicious sign. Ah well, in the evening we would celebrate a tsok,a ritual meal that feeds the local guardian deities. Surely that would improve things. Meanwhile, a little magic did transpire. 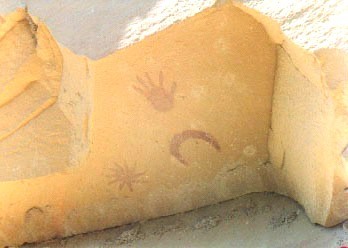 At the actual moment of the solstice, we were sitting in a circle near the pictograph featuring a crescent, a disk with ten rays and a hand which is interpreted by some to be a record of the nova which appeared over the northern hemisphere in 1054 and is now called Crab Nebula. It was visible in the day sky for three weeks and recorded all over the world when it occured, except in Europe. Apparently, no one there was looking up at the time. We were far enough off the beaten track to burn a little incense and say some prayers without attracting the wrong kind of attention, when a pair of gentle-eyed strangers found us. They sat with us and listened to us and sang with us for a bit and then talked with us. Then they talked to us. They said they had known just from seeing us that we were some kind of spiritual practitioners, and as they sat with us and observed our process, they truly appreciated Padma Shugchang's role with us: a teacher, not a leader--someone who walks behind, not in front. Someone who helps people find themselves--and that we should not become confused by expecting him to lead us in some conventional fashion; they could see that that is not what he is about. Then these mysterious strangers went on their way, leaving us amazed at the strength of their blessing energy and wondering who--or what--they really were. And so the morning's disappointment was mollifed, and we felt some excitement and expectation as we began to prepare for the tsok. Part of the tsokritual is the drinking of alcoholic beverages, which are transformed by prayer into wisdom amrita. The wisdom amrita on this particular evening was thick and red. Not everyone cared for it, but Shugchang, Sadie, Zoe, and a few others returned for cup after cup of the precious nectar. Eventually, Sadie became too full of wisdom to remain conscious, and sprawled out among her fellow celebrants, oblivious. In the crowded space of Tsering and Rigdzin's tent, it seemed like the thing to do to get her out of there and into her own bed, but she could not be roused. The tent she shared with her mother was a long way from the gathering, and she was a fairly hefty young woman, so Shugchang gallantly offered to let her be parked in his nearby tent. We lingered long over the tsok, finishing off the last of the delicacies and the wine, and absorbing precious helpings of Shugchang's wisdom. In the wee small hours he delivered a final summation of the evening's teaching: You guys treat me like I'm your father! before passing out drunk, thus signalling the end of the ceremony. The remainder offerings were tendered to the dharma protectors (who probably took the form of raccoons for the occasion), Shugchang roused himself and led us in dedicating merit, and we repaired to our tents to sleep it off. Or so we thought. Perhaps the smell gave Shugchang his first warning. Then, perhaps, the feel, as he began crawling into his tent and his hands contacted--something gooey. And then, clicking on his flashlight, the sight. Barf. Everywhere. It had come out of Sadie. It was all over Sadie. All over Zoe. All over all the packs. All over all the sleeping bags. In all the sleeping bags. Oblivious to the shining lights, the cries of dismay, and the viscous, chunky liquid that coated their skin, clothing, and hair, the girls slept on, unresponsive to even the most direct attempts to get their attention. We rose to meet the emergency, providing Shugchang and his family with dry bedding, and hauling the unrousable girls to a cold water tap where we washed them from head to foot in the cold desert night. They did not wake up. Zoe recalls coming to in the morning, discovering herself in a different place and in different clothes from her situation when she fell asleep. Sadie accompanied her mother, Gyatso, to the laundromat the next day in Bloomington, and did her best to help clean up while coping with a terrific hangover. Surely an event like that signified a major cleansing of our collective karma. Surely we had been reborn, there at the navel of the world. On to Mt. Taylor! It's time to try the Southern Door! But first, we would find, there was getting there. On the way out of Chaco Canyon, Sadie, by now recovered, was riding with Tim and Mark in Tim's sporty little car with the sunroof. Tim, being a healthy young man, dug Sadie, and when she stood up and stuck her head out the open hatch and let her blond hair ripple in the wind, something broke wide open in him. This was a Goddess in the back seat, by God. He floored the car down the winding road. Faster, wilder...a crunching noise started as the car wheels rolled through roadside gravel. Sadie did perhaps have a touch more omniscience than usual, or maybe it just wasn't as comfortable facing the slipstream at seventy-five as it had been at fifty-five. In either case, she suddenly felt moved to drop to the floor of the car and scrunch up in a little ball, as the car left the road and rolled over, coming to rest with the driver's side on the ground. Tim's adrenaline took over as he scrambled over Mark, out the passenger window, and away from the car before even thinking to check on Mark and Sadie. He was afraid the car would explode. Fortunately, it didn't. As Sadie climbed out of the now-silent wreck, though, she found herself reflecting on the Bardo teachings. You will probably be in such denial about your death that you will blank out the actual moment of death and the white light, and come to in your body of habits, thinking that you are still alive. How can I tell? She wondered. Maybe I didn't really pull my head in in time. Maybe I'm lying there dead in the back of the car. Then it occurred to her that she had left her flute on the seat. Since there was clearly no longer any danger of explosion, she went to look for her flute, and see if her body was there. It wasn't. Her flute was. She breathed a big sigh of relief. Part of the problem, it seemed, was that nobody was very good at thinking for themselves. In spite of the friendly strangers' observations, we looked to Shugchang for direction, or went off the deep end following our own ideas at inappropriate times. This motif was demonstrated by the dance we did on the way from Grants to Mt. Taylor. After we all gassed up together, Shugchang had stopped at the ranger station to get a map. He had communicated this move to Samten, who had gone to a taco place, but drove right past the ranger station and Shugchang's car without noticing, and figured that he was somewhere up ahead. With Tsering following him (she and Rigdzin had been fighting so much that they were travelling separately) Samten charged on up the slopes of Mt. Taylor. When he arrived at Coal Creek Campground, at the base of Turquoise Mountain, Samten found Yiga and Rigdzin already bivouacked. Samten was sure this was not the campground where they were supposed to meet Shugchang. He was sure (without benefit of a map, Shugchang being the only mapholder) that Shugchang was at a campground further up the mountain. Samten can be very persuasive. We broke camp, and Samten led our caravan up the mountain on a forest road that had not been built for his low riding station wagon, or Yiga's big bread van or Zhibde's borrowed compact car. It was her sister's; she'd promised to take good care of it, and the state of the road she was taking it on upset her greatly, but she followed. Chiding his wife for her doubts, Samten continued up the road until it degenerated into a boulder-strewn path. We were close to the radio towers that crown one shoulder of the mountain, and had found no campground and no Shugchang. Oops, said Samten.--C'mon, guys, it was an honest mistake. It was nearly dark by the time we got down to the original campground. Shugchang's family had set their tent up here not long after we had all left. They and others had gone on a walk. Everybody was tired, hungry, and bugged with Samten and ourselves, but since the propane was in Yiga's van, which hadn't made it back down the road yet, it would be a while until dinner. Let them eat cereal, Getso quipped, heedless of the fate that had met Marie Antoinette for a similarly heartless suggestion. When we got to Mt. Taylor, my fear kept me from listening well to the directions. Samten thought we were to drive to the top. We did, and as the road got poorer, I said, I don't think this is right. Samten said, that's just doubt. A little further on the road worsened, and someone else said, this can't be right. Samten simply labelled it Doubt #2, and kept driving. The road was soon full of boulders and I said, this is not right. And Samten said Doubt #3, and drove a little further, then realized it was impossible to continue. We got out, tried to take in the view for a minute, and then turned around to start back down. When we got to the campground, other cars from our group were already there, their tents were up, and they had gone on a walk. I wanted to start dinner, but Samten said, I was too preoccupied with the material plane, and that I should sit down and relax. I didn't want to, but I believed him and tried. Yiga hadn't arrived yet, and he had the propane. So I told the teenagers, there's nothing we can do now, and went back to the tent. When Shugchang showed, the camp was quiet and he was pissed that there was no food prepared. Yiga and the propane had arrived while I was hanging out with Samten, and being the only cook in camp, I hadn't done anything to pull it off, not even directing the teenagers to the task. We finally ate tortillas sometime after 10 pm. I didn't talk at all that night when we hung out. The next day I thought, I need to communicate with Shugchang more, and looking down, found two orange feathers. We spent the next day taking it easy and doing short hikes to get acclimated, with the idea of an early, early morning hike to the top of Taylor that, even if we missed the actual sunrise, would give us the sweep of the landscape in that magical early morning light. Perhaps the Southern Door would swing open for us. 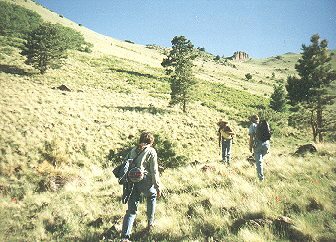 So we hiked the area around the camp that day and while up on a dark foothill named La Jara, Padma Shugchang told the group part of the Navajo creation story. 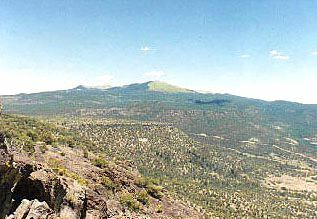 For some of the crew, a good part of the day was spent on La Jara, considering this, chanting and meditating together on this little volcanic promonotory a few miles from camp. The thin air of the high Rockies was having a psychedelic effect on everyone; but alas, enough of us had neglected our homework that it was not all that pleasant. Samten and Getso, neither of whom joined the vigil on La Jara, continued to feel the aftershocks of their ride up the mountain, Yiga was up there, but as the day wore on, was moved to dramatize his independence in a dangerous way. Deciding to forego the next morning's climb, he returned to spend the night alone up on La Jara, where he fell and hurt himself jumping across the tops of the abrasive volcanics in the twilight. Rigdzin and Tsering kept to neutral corners, all the women (more or less privately) nursed their hopes, fears, desires, and jealousies in regard to receiving Shugchang's undivided attention, while we menfolk did our best to be just like him, in hopes of receiving the undivided attention of at least one woman. None of this was unusual, but when you're struggling for breath it becomes a lot more pronounced. At four AM, it was time, at least for some of us. Shugchang roused all the climbers (part of the crew would stay behind with the young children) and smudged us with sage. We piled into a station wagon and in the early dim, drove a few miles past the trailhead, finally parking somewhere on the southern slopes before wandering through the woods, following many a cow path in vain, in search of the actual trail. As the bloom came off the morning and the heat of the day began to set in, it became obvious that we had been wandering around the mountain and had failed to find a trail which led upward. At ten AM, we found ourselves in a cow pasture, with a pleasant view of the distant peak of Mt. Taylor, sipping Gatorade and wondering just where the path might be. At this point, Shugchang suggested an uncommon practice which seemed quite appropriate, and so we circled up and did the relevant prayers. As we assumed the lotus disposition, regenerated the mandala and that old familiar shiver ran up our spines, our hopes and expectations began to rise again. Empowered, entering a power spot, with powerful intentions. We could see the peak of the mountain. All we had to do was head towards it, right? Two hours later, after climbing up, down and across numerous ridges, we began to assemble at the summit. It had taken us almost eight hours to get there; the descent (on the right trail) would last less than two hours. Samten and Getso weren't there. Exhausted by lack of sleep, thin air, subconscious, and the effects of the practice, Samten had felt too weak to continue. Getso stayed with him. He was enjoying himself, feeling ready to die; as she sat near him, she saw wave after wave of horrible-looking creatures sweep up to her, over her, and through her, in spite of her continued prayers and offerings. When, years later, she finally asked Shugchang what that was about, he told her simply and directly, "Those were dharmapalas, and they were attracted to your ego, because there was so much of it." The ride up the hill was a real boondoggle and now there were vibes over dinner. It grew late and I went to bed without communicating anything I felt. I was upset. I felt that Samten, being a man, had easier acess to Shugchang, and more time to spend with him. I felt helpless to change my lack of communication. We talked for hours. We rose at 4, after just a few hours of sleep. Shugchang was smudging everyone with a large sage wand from Black Kettle Grasslands. After smudging us, he handed it to me to smudge him. We drove up the mountain in the dark and then walked several miles trying to find the path, and finally climbed to 10,000 feet on a cattle trail. It was steep and the air thin, I could only take 5 or 6 steps before stopping to catch a breath. Shugchang gave us his blessing on a grassy hillside. We climbed further and stopped and Edward went into what looked like diabetic shock, he was shivering, lightheaded and sweating. I handed him an orange and sat him down in the shade. He later said that he felt like he was going to die, and that this was a nice place to die. He got better, but still felt weak. As we walked further we arrived at a basin with wind sweeping up it, and spilling over the crest of a rocky ridge. I placed a paho there, with a prayer for sentient beings to balance their male and female energies. A bit farther, Samten said he could not go on. I said, let's keep up, and he said he really couldn't. Shugchang had said to partner up for safety, and he was mine, so we took cover in some evergreens. Samten slept. I closed my eyes and saw fantastic visions of gross, bloody, threatening spirits. I didn't know whether it was best to keep my eyes closed and watch them or open my eyes and stop them. I found some cow dung, made an altar of it and started burning sage on it, spreading cornmeal atop it. The dung smoldered and caught, and the aroma of high altitude plants pervaded the little grove, shafts of sunlight pierced it here and there, birds flitted through, singing. Samten woke and I rubbed his back. We talked about going up and he said he could not. So we rested, talked, and prayed. The view was amazing. I placed my other pahos outside the grove in bright sun. I faced one to the north, praying for all beings to be enlightened, and two south, praying may all beings be free from ignorance, and may the Sangha be happy. When Samten said he thought he could make it up, I doubted his stamina, and our water reserves being low, I thought we should start down. Samten apologized that we didn't go up; he knew that I could have made it. I had been in turmoil realizing this, but felt it was my responsibility to stay with him, and not be so selfish. After all, I had kept him up most of the previous night worrying about my ego. Zhibde had been on top of it. She had been up ahead of everyone else, really on the trail to the peak. She did not believe in goofing off. And so she was furious when she heard that we had taken a moment out to practice without her. She felt cheated -- she wanted to have been there for the main ceremony. We chanted together on the peak as well, didn't we? Nothing seemed to make her feel better. How can you change the past? Although the climbers didn't know it, trouble was brewing back in camp. Rigdzin and Cruz were there, playing White Zombie again, and when Cruz offered to watch Rigdzin's kids so Rigdzin could climb the mountain, Rigdzin got mad at him, yanked him off the car hood he was laying on, and started pounding him. This doesn't make sense, does it? Does violence ever make sense? Anyway, those nosey locals across the valley just had to go call the police, although by the time they arrived, Rigdzin had calmed down and Cruz was in a forgiving mood. Not so far away, the main body of us, nine in all, were finally enjoying the pureland-like view from the summit. Malpais, Big Monster's coagulated blood, stretching south toward the horizon, a blackened sea of hardened lava, some of which flowed as recently as a thousand years ago. There is a small hollow on the peak, one of the old vent holes, just big enough for a handful of people. Some of us huddled there below the ground and set up a small crystal altar, leaving a few fine specimens for the next lucky pilgrim to take home. A stand of red-coned Engleman Spruce trees had established itself on the north side of the peak, and we gathered there, to hang prayer flags, offer pahos and tormas, and see if the Turquoise Door would open. We launched a few simple, heart-felt prayers, distracted only by our own subconscious and hordes of flies. What do they do when there are no people around to bother? They seemed to descend from the sky in spirals, a vision out of M.C. Escher. Flies and all, we were ready to never come down. As we settled into the silence, the sunlight connected every point with every other and we looked at each other and Awoke, realizing that, even here, on this mountain top, in this place of power, we were still in the same Room. The southern door did not open. But perhaps we got a glimmering of an understanding that the Room was made of our selves, and that no amount of strenuous exoteric purification would ever get us out of it, no amount of changing our selves would ever get us out of it. The only way out was to transcend even the desire to get out. And that we had yet to do.